Yes, I’m back. Missed me? Sorry about that. But unfortunately sudden disappearances tend to happen when you have Sickle Cell disease. I’m feeling all better now and ready to jump back into the swing of things. While I may have been down, I surely was not out. I brought back a little treat with me made just for you- a free pattern made by me! Yup, that’s right, I published another pattern. What kind of pattern? Well, a sock pattern, of course. But this one is for the men. The pattern is published through the yarn company, Galler Yarns. As a bonus, I also did an interview with the company that was published on their blog here. So, take some time to check out the interview and pattern, then tell me what you think. Well, last week I got my first sock pattern rejected by the online knitting and crochet magazine, Tangled. It was the Sunset In Sedona sock that I posted on the site Sunday. I figured that as I make and submit socks for consideration in magazines, any that get rejected will be posted on Ravelry for all of you to enjoy. It’s odd, but I don’t feel at all bad about being rejected. I was able to create a pair of wonderful socks in a yarn that I love and I finally sat down a wrote out a sock pattern- which wasn’t too painful. The best part is that I got to share it with all of you. So that makes me happy. Well, it would be nice if that happened. But until then, I’ll just keep knitting more socks and seeing where this yarn covered road takes me. Ladies and gentlemen, may I present to you the two needle sock! Go ahead, gasp in its awesomeness. Ooooh over its beauty. Be amazed by the fact I actually finished something! 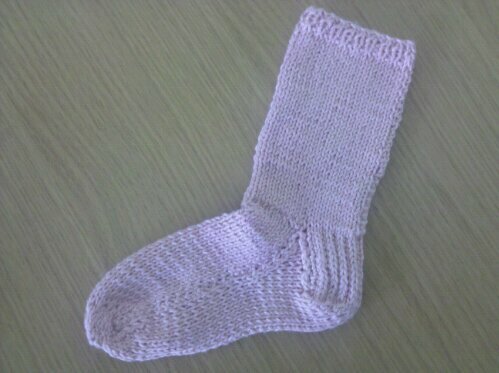 This is my first sample of trying out a two needle sock pattern. I made a few mistakes that I will be able to make changes to when I make the actual pair. Overall, I love the way it looks and how simple the pattern is to follow. I can see how easy it would be to add a pattern down the leg area. Okay, its official. I’m addicted to two-needle sock knitting. Yes, you read the title of that post correctly. There is no typo. I am knitting socks using only two straight needles. I decided to do this after my failed attempts with DPN’s and circulars. I even tried the ‘magic loop’ method and realized that when you start reaching for the rum and coke then that’s the time you stop and find an easier way. Knitting socks on two needles is by far the better way for me. I don’t mind the fact that I will have to sew seams later. I have no fear of the sewing needle, (I’m a damn costume designer, after all). 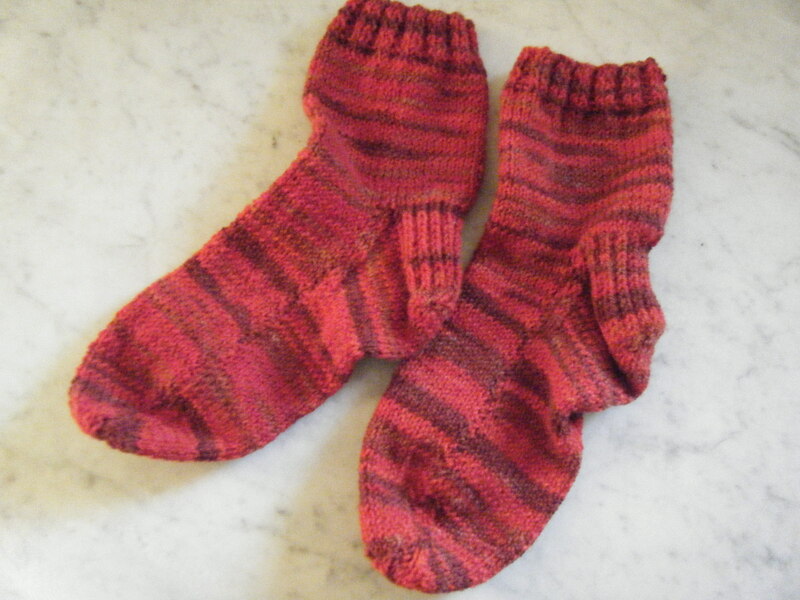 There is not as much information about two needle sock knitting. Most of what you will find are from the early 1900’s. That was when two needle socks and mittens got real popular. I feel this type of knitting is well overdue for a modern renaissance. So, right here, right now, upon this pair of pink cotton toddler socks, I vow to bring back the noble art of two needle knitted socks, so help me God! When I get more work done on these socks, I’ll give you a link to the pattern. FYI- I’m actually knitting both socks at the same time.